With its precise frequency control, ample output, and compact design, there isn't a musician out there who wouldn't benefit from adding a Wampler EQuator EQ pedal to their rig. Bring up only the mid frequencies you want to help your instrument be alive in the mix, dial back the highs to tame any kind of harshness from the room you can even completely change the character of your favorite drive pedal. With its sheer versatility, the Wampler EQuator will quickly become your not-so-secret weapon. 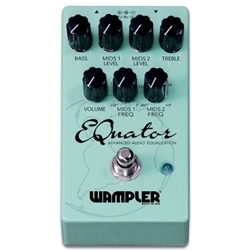 Wampler designed the EQuator around the needs of the player, refusing to riddle it with too many small sliders or overly complicated switching. Nailing the tone you desire is an intuitive affair that you'll find invaluable in the heat of a performance. Whether onstage or in the studio, time is at a premium. Get your perfect tone faster with the Wampler EQuator. Brian Wampler's attention to detail and commitment to designing the best and most player-friendly products out there are second to none. Those qualities are on full display within The EQuator. From its convenient top-mounted jacks to its impressively low noise floor, The EQuator semi-parametric EQ pedal is every bit a Wampler.